Why does everything sound better in French? While they might smell the same there's just no comparison between the ambience evoked by 'cheese shop' as opposed to 'fromagerie'. 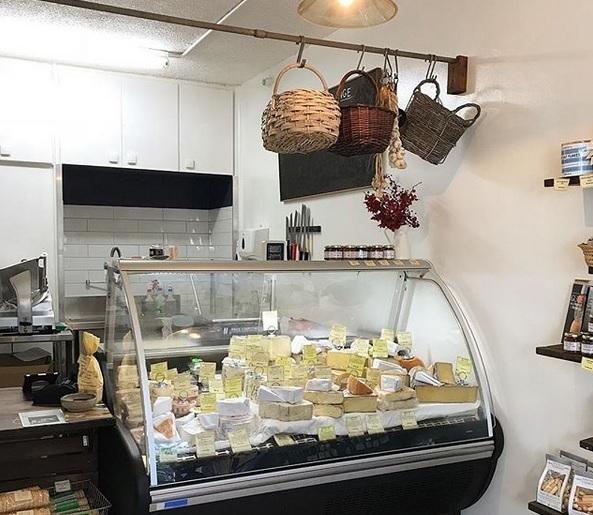 You might be interested to know that Brisbane has its very own authentic French fromagerie. 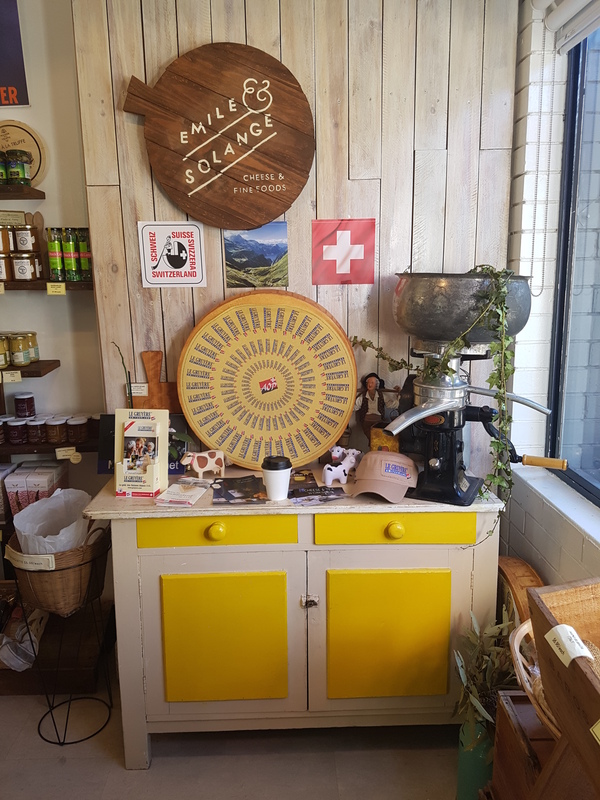 Emile and Solange Fromagerie is a pocket-sized cheese shop that packs a big punch, much like the exquisitely packaged portions of cheese that are arrayed in its display case. It's a slice of creamy and piquant Normandy in industrial Albion, and if you love cheese, it's THE place to be in Brisbane. Clapboard sign. Image by writer. I visited this boutique store recently with Designing Daughter. It sits within the Vieille Branche creative space, behind a charcoal painted brick facade with a sliding window and wrought iron awning. A clapboard sign announces its existence to the street. It's delightfully petite and welcoming, brightly lit by industrial-style lighting, with vintage French posters on the walls and colourful and eclectic accoutrements. Baskets and garlic hang jauntily above the cabinet and fresh baguettes in white paper bags sit in a wire basket. 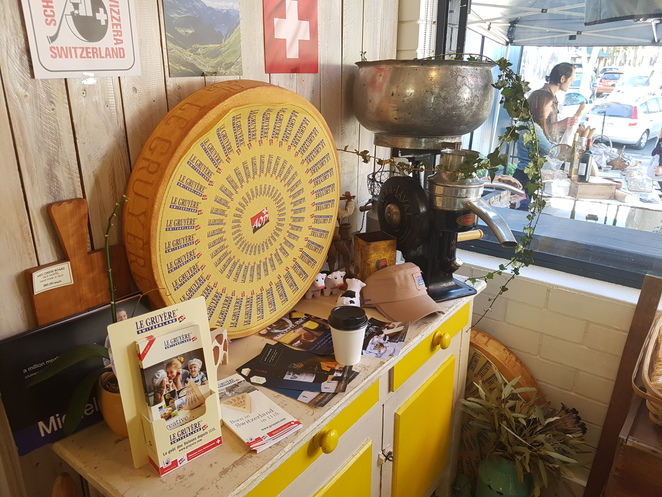 What looks like a homey jumble of objects has obviously been carefully curated to convey a relaxed, vintagey vibe, much like the Vieille Branche space itself. We loved it. Colourful, eclectic decor. Image by Julia Massey. Used with permission. Industrial shelving holds a melange of the perfect accompaniments for cheese. 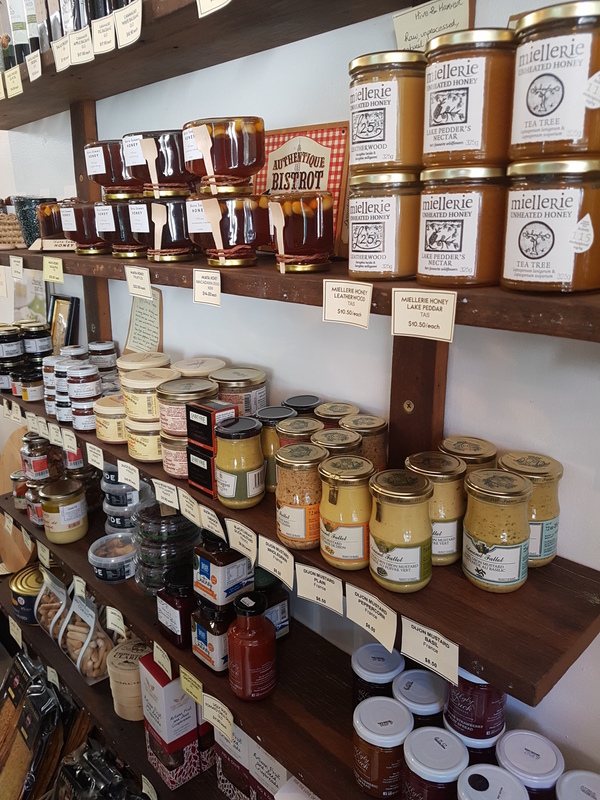 You'll find everything from saucisson, rillettes and terrine to confit, mustard, honey, duck fat, cornichons, jellies and crackers. All the cheese accompaniments you can think of. Image by Julia Massey. Used with permission. But the pièce de résistance of Emile and Solange is undoubtedly the curved glass display case chock full of cheese of all descriptions, origins, colours and sizes. I was instantly transported back to primary school and Mr Tierney's shop full of kid-sized treasures and a huge assortment of lollies under gleaming glass. There, a box of freckles was temptingly arrayed next to a jar of chocolate buttons; all day suckers abutted lolly bullets and cigarettes; and sherbet packets sat beside red and green frogs. It was magic. This instead, was proper magic for grown-ups. Surveying the throng of 'cheesy comestibles' at Emile and Solange it was all I could do to resist the urge to press my nose against the glass to take in all the delights on display. Maybe I did press my nose against the case - it was hard to be sure in all my drooling excitement. I do know I forgot to take a picture. Oops! In my cheese-induced psychosis I forgot to take a picture. Image from Emile and Solange Instagram. Goat cheese, cow cheese and sheep cheese; soft cheese and hard cheese; yellow cheese, blue cheese and delicate, creamy cheese; wheels, wedges and tiny bricks wrapped in white paper; Gorgonzola, Pecarino, Gouda, Maroilles and Roquefort cheese all looked beguiling, topped with yellow descriptive labels in silver place holders. Paper-wrapped slice of heaven. Image by writer. Just like all those years ago in Mr Tierney's shop, it was just too hard to make a decision - the paradox of choice in action. Owner Sarah Thuillet recommended the Brebirousse D'Argental, a 'deliciously oozy', washed rind, sheep's milk cheese with a gently-furrowed orange rind. We also bought a baguette and a small jar of fig and walnut confit to fashion a tasty afternoon tea. Miam! (that's French for yum!). Afternoon tea. Image by writer. Sarah grew up in Normandy where her grandparents, Emile and Solange, had a store selling their own milk, cream and butter, as well as locally-produced cheese. But the eponymous Emile and Solange is not just a cheese shop. They also specialise in cheese and charcuterie platters, gourmet hampers, and catering for weddings, parties and events. 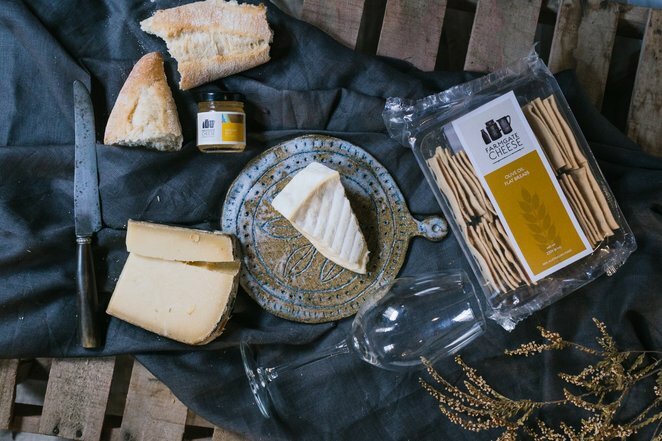 You can order online from their extensive range of cheeses and accompaniments, and, if you order from Wednesday to Saturday between 8am and 2pm, and if you live in their specified list of suburbs, you can receive your gourmet cheesy package within 4 hours. See their FAQs here. A creatively curated corner of Emile and Solange. Image by Julia Massey. Used with permission. Emile and Solange also host Cheese and Wine Club events, including tea and cheese tastings, and wine and cheese tasting evenings. You can see the list of their upcoming events on the Facebook page here. Also see some of their enticing Instagram images here. The shop is open Wednesday to Thursday from 10am to 5pm, Fridays from 10am to 6pm, and Saturdays from 8am to 4pm. They are open for Vieille Branche's highly popular Makers Markets. Image from Emile and Solange website. English writer G K Chesterton once famously said that "Poets have been mysteriously silent on the subject of cheese", but I don't understand why that should be so. Perhaps it's just the English poets, I'm certain the French poets would see things differently. I think that cheese, in its myriad iterations of colour and taste, and its ability to bring people together to share, is genuinely poetic. And you won't find a more poetic place in Brisbane to source and enjoy it than Emile and Solange. Why? Delectable cheese, charcuterie and more. When: Opening hours: Wed-Thurs 10am-5pm; Fri10am-6pm; Sat 8am-4pm. Cost: Varies. See website for pricing details.